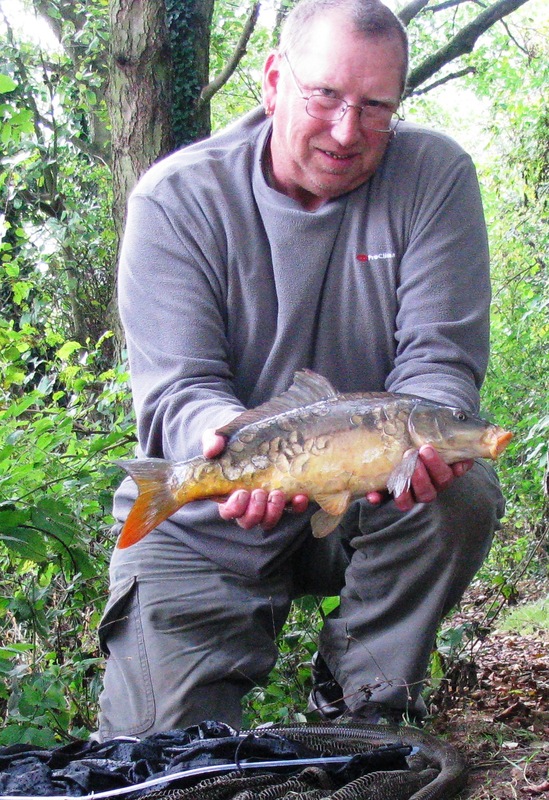 Monday, September 29th, and I’m again back at the local carp pool, arriving at around 0745. And the first thing I did on arrival was to throw out my depth sounder again… as the bottom of the pool here is quite interesting – a lot of almost vertical long drops – and as the pool bottom is full of bricks and boulders I wonder if in fact there had been a building standing on the site that was demolished and then the land dug out for the pool – which was originally a trout pool I believe – and the drops are parts of old cellars and walls? Apologies for quality but not an easy video to make without a tripod and with a £30 digital camera from China via eBay (:)) but you can see the results OK… The retrieve rate of the transponder was about 1 yard per 2 seconds to give some ideas of the distances, etc. 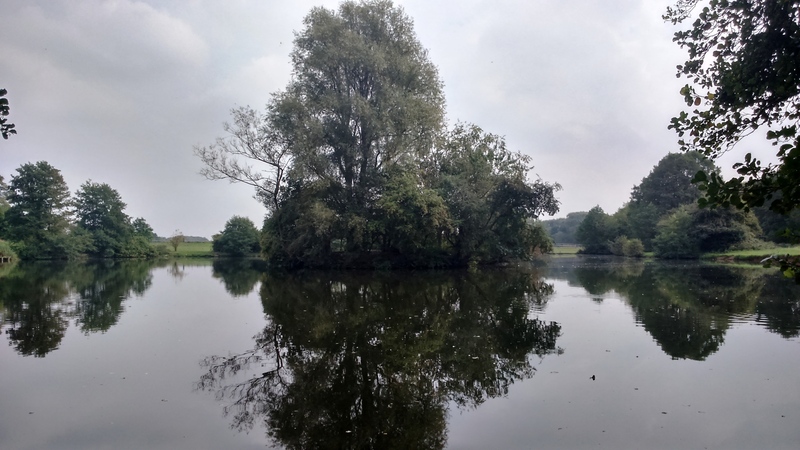 Anyway, next job was to bait up my swims for the day – the first swim was aimed to be that 25ft deep section straight out in front of me, the second swim about 8 yards out off the end of an overhanging tree on the left hand edge of the peg. Both were baited with crumb mixed with commercial groundbait, fish/bone/blood, gravy granules, custard powder, chocolate mousse mix along with a hemp/maize/wheat mix and added maggots…. The tackle for both rods were identical except for hooks – 1.75lb TC 11’ Avon Barbel rods, 8lb line, 1/2oz (free running on 3” links) bombs… The long range rod was fitted with a size 6 Kamasan ‘Animal’ eyed barbless hook, the near range rod with a size 12 of same type. 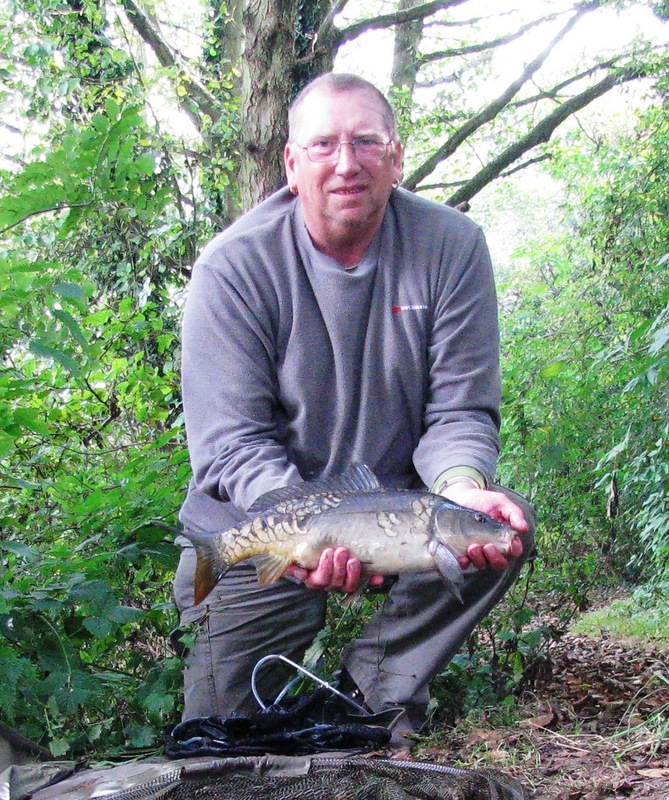 And first casts were made after all pre-prep was completed (unhooking mat, camera on bankstick, landing net set up, baits and small equipment laid out). I *ALWAYS* pre-prep my ‘station’ pre-first casts – there’s nothing worse than casting out, having a bite and the landing net is not set up, the unhooking mat is not ready, forceps/disgorger are not handy, scales and weigh net are still in bag, camera is still in bag requiring to be fetched, set up on bankstick, aimed, focussed, etc. All adds to the stress!!! 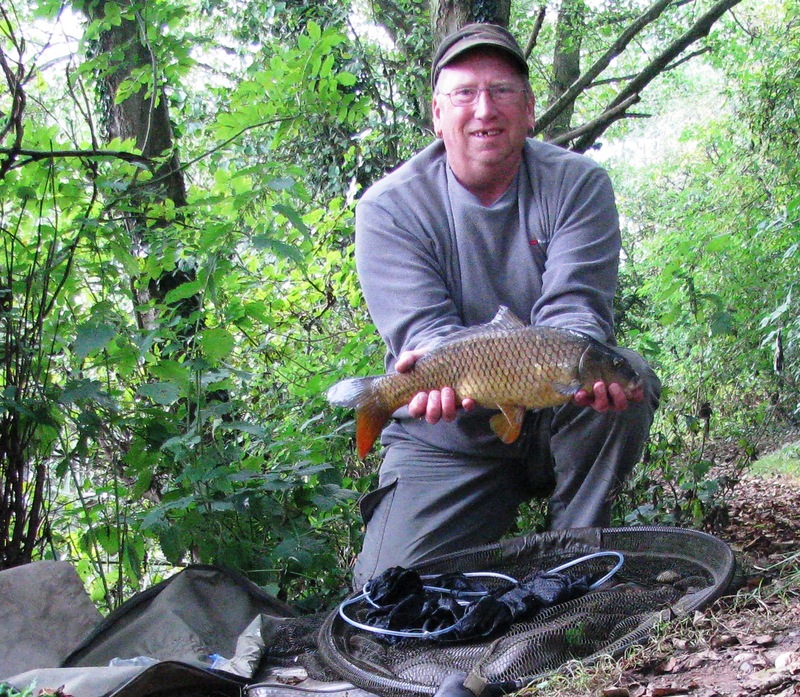 So I spend a bit of time getting everything set up in readiness before casting – and as soon as the first fish is played out, the landing net is ready, fish is on to the mat to unhook, weighed, photo’d and returned to the water all easily within 2 mins, and that even allows for the camera’s self timer set to fire after a 20 second delay plus a further 4 shots at 2 second intervals. Try doing that with northing prepped!!! And so it was 0850 when the first casts were made with bread on the long range rod, worm on the short range. Whilst fishing I’d been feeding out a few floating dog biscuits and bits of old crusts from my bait loaf and there was a fair bit of action on the surface and so I thought I’d try some floating bait… but had also noticed that te fish seemed to be, again, ina ‘testy’ mood – bashing the floating baits about a lot… so this plus the fact I didn’t really want to get my specific rod out of the bag led me to fish a ‘zigged’ up bait – basically a floating bait on a leger rig which is then cast out and the line left slack until the bait floats back to the surface and then the line is tensioned just enough to pull the bait the required depth below the surface – and in my case this was around 6”-12”. 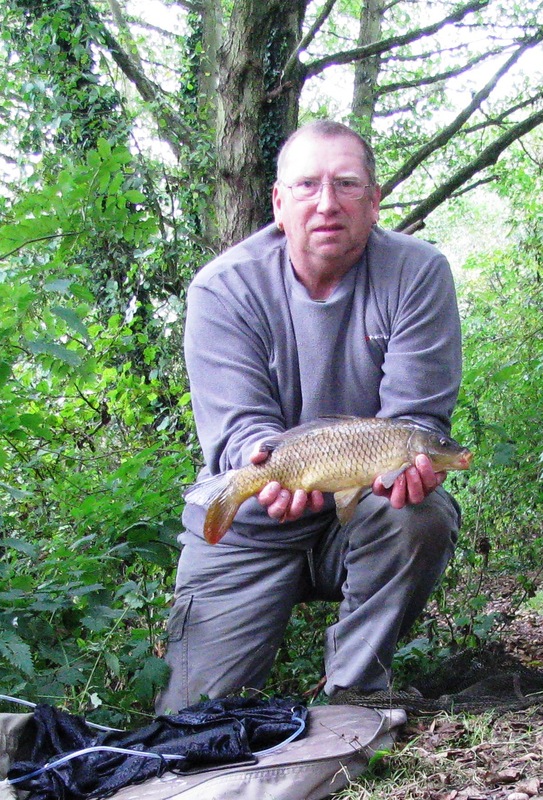 And this was successful in that shortly I had netted a 4lb 2oz Common Carp. And over the course of the rest of the day I successfully landed…. At this point, I had lowered my worm rod’s tip down in the water to prevent the lines from tangling as I brought this fish in… and as I was playing the fish the worm rod was pulled viciously across… I grabbed it but there was nothing there… as the line had been snapped… :(. As time was getting on I decided not to re-tackle this rod and continued for the rest of the session with just the one rod. And one other thing happened that nearly stopped my heart beating….